Let me start by saying that I’m no expert with DNS and host records. I’m just someone who owns websites and am therefore forced to know a thing or two about DNS. On this post, I want to teach you how to setup your host/DNS records on your domain registar (in my case Namecheap) and not on your webhost. In other words, if you are using registrar’s nameservers and not your webhost’s, then this post is for you. Before I start, I want to say that the easiest way to make your site work is to simply use custom DNS servers (e.g. ns1.yoursite.com, ns2.yoursite.com) which your web hosting provider will give you upon application-payment of an account. Obviously, the advantage would be it would be easier to setup for the noob like me. However, the downside is if your web host goes down for whatever reason and you are using it as your DNS server AND you are using 3rd party services like Google Apps for your email, then your email won’t work. That’s why setting up your host records on your domain registrar instead of your web hosts is a good thing because if your host goes down and your MX records are on your registrar, then your email will still work! Now on with the good stuff. A picture paints a thousand words so here’s a picture of the basic setup you should have (this is a Namecheap screenshot but it should be similar with other registrars). The IP address of your server. This can be obtained from your webhost email or you can find this on the left sidebar of your cPanel (if you use one). The 3rd entry is for the email to work. It is the same as the first two except for the host name which should be mail. 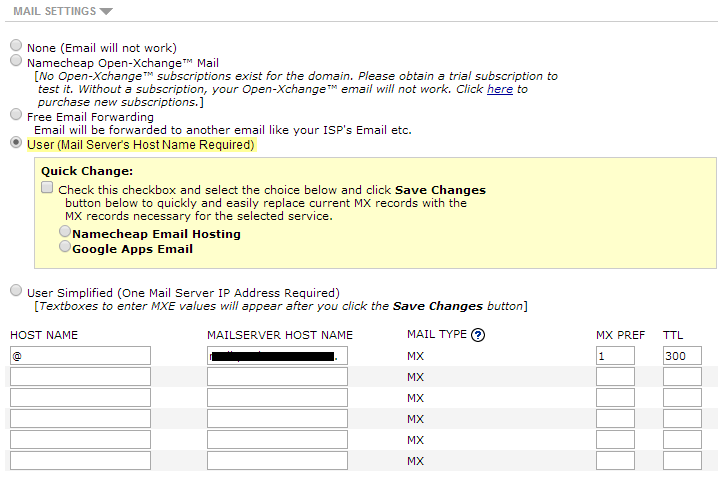 Under Mail Settings, you have to choose User (Mail Server’s Host Name Required). Then put @ as Host Name. Put mail.yoursite.com. (notice the . at the end) as your Mailserver Host Name. Again, you need the 3rd entry (A record on the How to Make Your Website Work section) for the email to work. That’s it! If you need more clarification, leave a comment below and I’ll try to answer asap.